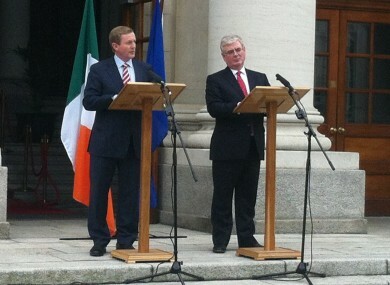 Kenny and Gilmore speaking outside Government Buildings today. THE GOVERNMENT has welcomed the results of the Fiscal Treaty referendum, with the Taoiseach and Tánaiste saying that the outcome strengthens Ireland’s position in negotiating with EU institutions and other EU members. “The Irish people have sent a powerful signal that this is a country that is serious about overcoming its economic challenges,” Enda Kenny said this afternoon. “The decision that we had to take as a country was not an easy one given all that we’ve been through,” he said, adding that he commended the Irish people for their “pragmatism” in understanding the magnitude of the situation. Gilmore added that Ireland must also progress in seeking a long-term sustainable deal for Ireland’s bank debt. “We take this result not just as a passing of the treaty itself,” he added, but as a call for the government to redouble its efforts in pushing for a better deal. He said that the result “strengthens our hand in negotiations with EU institutions and other EU members”. On the issue of debt, Kenny said that “Ireland’s banking debt must form part of a wider European solution” to the international banking crisis. Responding to questions outside Government Buildings, Kenny dismissed suggestions he would not be a strong negotiator because he was reluctant to debate Sinn Féin TD Gerry Adams. “I stood up to a lot more pressure than Gerry Adams could ever exert on me,” he said, referring to pressure on Ireland to change its stance on its corporate tax rate. This afternoon, National Returning Officer Ríona Ní Fhlanghaile announced the final results of yesterday’s referendum, giving a 60.3 per cent Yes vote (with a margin of 326,003 votes over the No votes). The national turnout was 50.6 per cent. Earlier today, Gerry Adams commended the returning officers on their work, but criticised the government for it’s “scare tactics” throughout the Yes campaign. Responding to questions about whether the government had frightened people into voting No, Kenny said that people had made up their own minds on the issue and said that the only fear in the referendum campaigns was generated by the No side. Kenny also commented on Minister for Finance Michael Noonan’s remarks during the referendum campaign that the next Budget would be tougher after a No vote. The Taoiseach clarified today that Budget 2013 will not be easier as a result of the referendum’s Yes outcome. Email “Ireland must progress in seeking 'long-term sustainable deal' for Ireland's bank debt”. Feedback on “Ireland must progress in seeking 'long-term sustainable deal' for Ireland's bank debt”.